Agrotorq 54 (Dual Grip) and the longest Wheelchair Weeder Graspex 60! From 36 to 60 inches to suit Your needs! Surmount the Economic Slowdown: Grow your own Food Organically. Buy tools and products that really work. A Sustainable Ecology is the Backbone of a Healthy Economy. Smart Shoppers Welcomed! Seasonal Specials - Secure Shopping Catalog! Do you have a Weed Twister in Your Tool Shed? Is there a Smarter, Safer hand tool to remove weeds at home or on the farm? Or anywhere near your family, children and pets? Remove weeds with Surgical Precision to protect cash crops like strawberries, lettuce, celery and grapes. Organic Growers may Use this tool as an alternative to hand weeding when crops are closely spaced and extra precision and care is required. Works great for both new seedlings and deep-rooted weeds in various situations including around the edges of plastic mulch. View this new lineup of Weed Twister models as an alternative to short-handled tools and knives that often injure workers and increase labor costs. Know your weeds to control your weeds: Deep roots or tubers? Wiry grassy roots, stems, runners and rhizomes? Woody saplings? New seedlings in hard to reach areas? Weeds in planters, containers, platforms? If it has a root of any shape, up to 1.5-2.0 inches in diameter, and as deep as 6 to 12 inches or more, it can be twisted and lifted by the amazing long-handled Weed Twister tool designed by Ergonica! Now offering five different shaft lengths and a couple of handle options to fit different people and different jobs, including the newest (and very popular) drill-ready Turbo Weed Twister as well as the longest 60-inch T-Handle model especially designed for wheelchair access, we invite you to Pick your stick, Muscles optional! End Crabgrass Nightmares with Turbo Weed Twister Power and Speed! Fastest way to Rid of Crabgrass, Bermudagrass, Mallow, all Tough Weeds! Great Lawn Conversion Tool to Rip Out Existing Lawn! Need a Wheelchair Weed Twister? Ideal tools for larger late season weeds with deeper roots! More Precise than most Hoes, Claws, Forks and Weed Poppers-Pullers! Great for Lawns! This includes troublesome weeds like dandelions, Ailanthus (Tree of Heaven), Malva (Mallow), crabgrass, Bermuda grass, and many other grasses, vines, woody saplings, tubers and annual or biennial taproot weeds in one or more years of growth ... Most other pullers, poppers, twisters, claws, hoes, prongs, cultivators, etc., will choke on any weed with roots deeper than 4-6 inches! Do you have weeds in places that are hard to reach? Are you uncomfortable when stooping down to remove weeds? Ergonica offers several models with different lengths (from 36 to 60 inches) and handle options, including popular drill-ready models, to solve your various weeding problems efficiently and safely. Refer to the Recommended Ergonica Weed Twister Tools Chart at left for practical and ergonomic considerations and use the Price Range Selection Tool below for economic values... making it easier for you to decide on the best values for one or more tools that really work for YOU (YOUR TEAM) AND YOUR WEEDS in various locations and circumstances! . Select the best tools by length and handle options to custom fit your needs and your weeds! 36" Ergonica Drill-Ready TURBO WEED TWISTER: The fastest and newest way to remove small and large weeds, roots and all, is with the added speed and convenience of hooking up this drill-bit Weed Twister with your 1/2 inch cordless drill. Faster, more powerful than a weed whacker-trimmer-eater! This tool efficiently removes roots and allows you to drop them in a waste container by reversing the rotation direction without stooping. See video! Quickly twist out prostrate grasses, like bermudagrass and crabgrass including roots and rhizomes! Use it as a weed whacker helper tool for weed maintenance and agriculture to quickly remove the plants and roots left behind by weed trimmers and weed whackers. Eco-friendly lawn conversion aid! Unique sleeve grip allows you to precisely focus this powerful long-handled tool where it's needed, without risking damage to your precious cultivars and crops. You have 30 days to return it from the day you receive it for a full refund (except for shipping charge). Shipped by USPS Priority Mail , FedEx, UPS or other Ground Carrier! Pulls out plants Weed Whackers-Eaters leave behind! Let your drill do the twisting: Muscles optional - Chemicals Obsolete! Lawn Conversion? This tool is a Must! Organic Farming made easy: Remove Weeds - Roots and All! How to select a matching drill for garden augers and twisters? 36" Ergonica T-Handle WEED TWISTER: Strong and deft weed deterrent. New comfort grip and increased steel diameter and strength . Makes a great Roundup Helper for weeds Roundup leaves behind. The Elegant Model works great for most people of average height and taller people working in planters, containers and raised platforms. Like Fingers of Steel: Twists out weeds that choke most other pullers and hoes! You have 30 days to return it from the day you receive it for a full refund (except for shipping charge). Shipped by USPS Priority Mail , FedEx, UPS or other Ground Carrier! that choke most other pullers and hoes! Need Help with Weed Twister Size Selection? 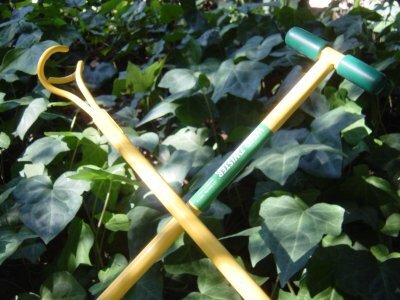 42" Ergonica T-Handle WEED TWISTER: Strong and deft weed deterrent. New comfort grip and increased steel diameter and strength. Makes a great Roundup Helper for weeds Roundup leaves behind. The Ergonomic model is ideal for taller people and for extended reach under shrubs and working around obstacles. Good size for use as a walking stick and critter defense weapon especially on wild trails. Like Fingers of Steel: Twists out weeds that choke most other pullers and hoes! Order the 42-inch WEED TWISTER today. You have 30 days to return it from the day you receive it for a full refund (except for shipping charge). Shipped by USPS Priority Mail , FedEx, UPS or other Ground Carrier! The Trail Buddy™ - Don't Leave Camp Without It! 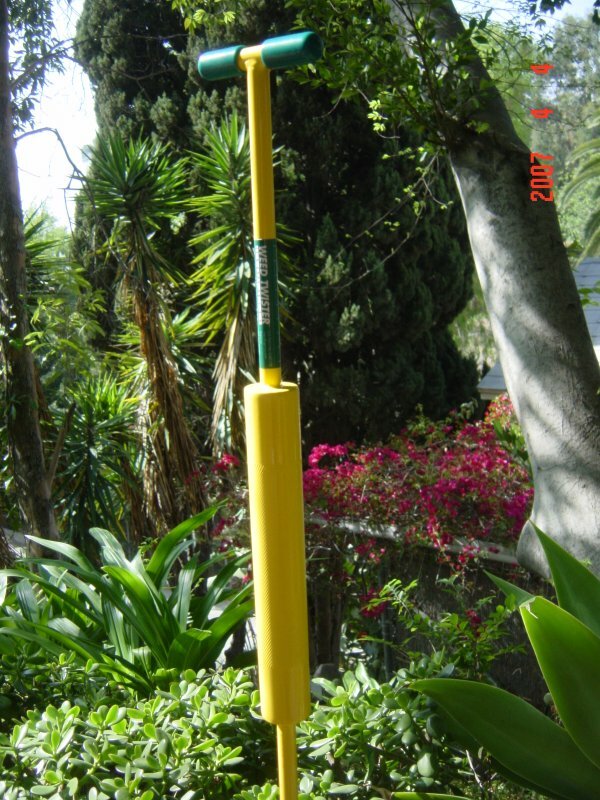 48" Ergonica T-Handle INDUSTRIAL WEED TWISTER: (Occupational Safety Standard Length) Strong and deft weed deterrent. New comfort grip and increased steel diameter and strength. The Industrial Model is recommended for your toughest deep-root weeds at home and to protect crops like strawberry, grapes, lettuce, celery, carrots and onions. Extra length recommended to protect workers from stress and helps to reach weeds from a wheelchair, as well. (See 60-inch Wheelchair Weed Twister below.) Quick, precise hoeing and deep root extraction. Like Fingers of Steel: Twists out weeds that choke most other pullers and hoes! Order the 48-inch WEED TWISTER today . You have 30 days to return it from the day you receive it for a full refund (except for shipping charge). Shipped by USPS Priority Mail, FedEx, UPS or other Ground Carrier! 54" Ergonica DUAL GRIP INDUSTRIAL WEED TWISTER: (The Ultimate Solution) Added Bar Grip with knurled etching gives you twice the speed and twice the torque: Small Tree Twister! Twist with both hands to go deep with ease. Added length lets you stretch your reach for twisting or tilling while balancing your control more easily with the added bar grip. With this tool we recognize that serious weeding is not child's play! It's all about the roots! Instant and permanent removal and satisfaction! The Dual Grip Model is recommended to twist out late season deep-root weeds in tough soil in gardens and farms, including mallow and volunteer potatoes, and to protect closely situated plants and crops like strawberry, grapes, lettuce, celery, carrots and onions. Extra length recommended to protect workers from stress. Quick, precise hoeing and deep root extraction. Like Fingers of Steel: Twists out weeds that choke most other pullers and hoes! Order the 54-inch WEED TWISTER today. You have 30 days to return it from the day you receive it for a full refund (except for shipping charge). Shipped by USPS Priority Mail, FedEx, UPS or other Ground Carrier! Last Line of Defense Against Tough Weeds! 60" Ergonica T-Handle WHEELCHAIR - SHALLOW WATER EXTRA REACH WEED TWISTER: (The LONGEST ONE) Strong and deft weed deterrent. New comfort grip and increased steel diameter and strength. This Wheelchair Model is especially designed and recommended for folks with wheelchair mobility and extra reach challenges above your head or beyond your path, as well as shallow water-pond precise weed pulling. Quick, precise hoeing and deep root extraction. Like Fingers of Steel: Twists out weeds that choke most other pullers and hoes! Order the 60-inch WEED TWISTER today You have 30 days to return it from the day you receive it for a full refund (except for shipping charge). Shipped by USPS Priority Mail, FedEx, UPS or other Ground Carrier! 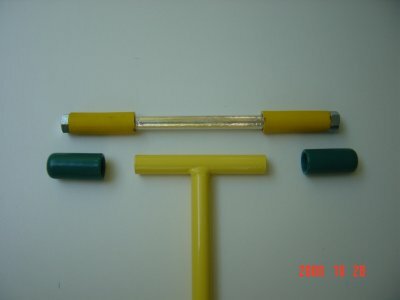 T-Handle Extension Kit for the Ergonica WEED TWISTER (Optional) increases the handle length from 4 inches to 8 inches. Especially useful in clay soil or agricultural settings or conservation land management when removing larger weeds to provide 2-handed twisting and pulling. Not needed for most domestic applications or for the Dual Grip Agrotorq 54 with the added bar grip. Can be purchased separately, if and when needed. 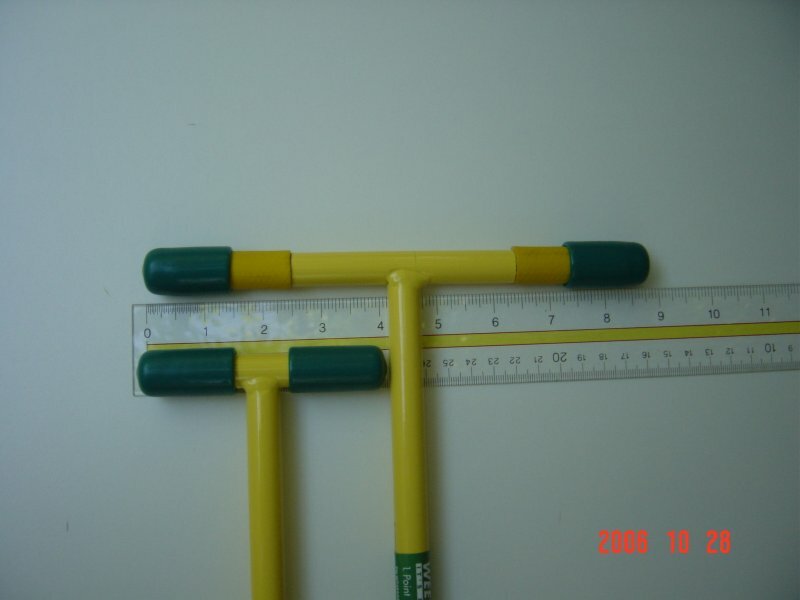 Easy to assemble kit includes strong steel rod with rubber grip tubes and hex nut. Works with all T-Handle Weed Twisters. 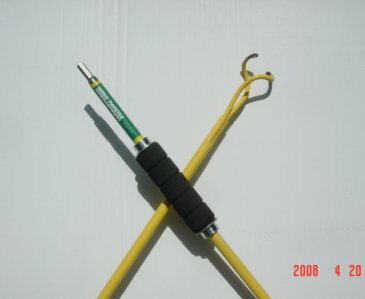 Order the 8-inch T-Handle Extension Kit today. You have 30 days to return it from the day you receive it for a full refund (except for shipping charge). Shipped by USPS Priority Mail, FedEx, UPS or Ground Carrier! Note: You're not going to find these tools, or anything quite like the Ergonica WEED TWISTERS on this page, with all their features and capabilities, at your local hardware or retail outlet - AT ANY PRICE! Please don't be fooled by similar names. To save gas and time, buy it here, today! Satisfaction guaranteed by Ergonica! What Types of Weeding Tools do you need? The Ergonica Weed Twister can grasp any root as wide as 1.5-2.5 inches, depending on the shape of the root and angle of attack. This is more than adequate for most taproot weeds, dandelions and mature mallow weeds, for example. And the length of the root can be as long as a dozen inches up to several feet! The 2.5 inch outer diameter coils can grasp 90 percent or more of the annual or biennial weeds you will encounter in your lawn or garden as well as many woody plants and perennial herbaceous cultivars regardless of the length or shape of their roots! 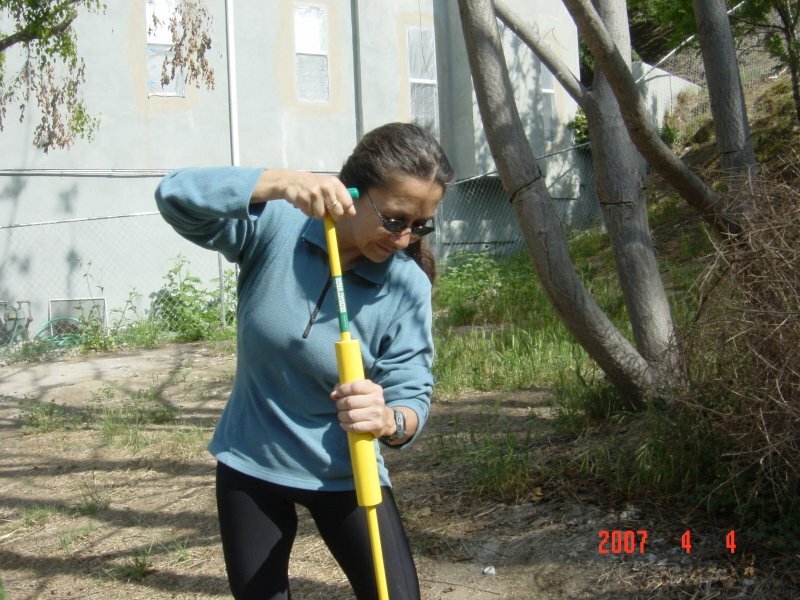 Using this amazing tool is like hunting or fishing for devilish weed roots in the soil! Don't let the big ones get away! 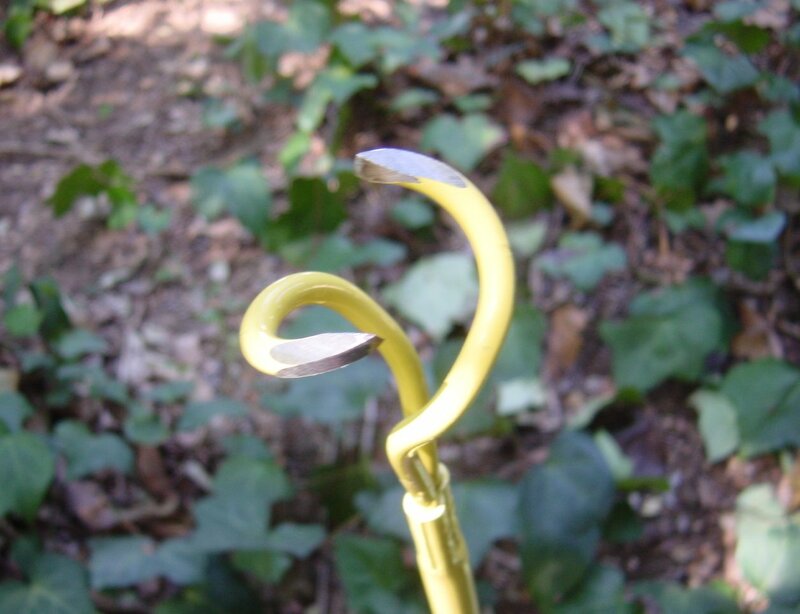 The more you use the Weed Twister, the more your technique will improve in finding and hooking larger and more wily weeds, as deep as the entire length of the tool! Like in fishing, sometimes the big ones slip away from you at first pass, such as when you don't center the main root into the coils. But with practice, you can learn to pull them in with greater power and skill. Use the longer Weed Twister models to catch weeds under water by river banks (spare the fish, please). When you catch a really big Whopper Weed (or dangerous snake?) with this amazing tool, take a picture and send it to us by e-mail! Sharpened tines improve Deep Penetration as well as Precise Hoeing efficiency - An unfriendly threat to any weed or underground critter... works on above-ground critters too - when on the trail. Make it your Trail Buddy™ next time you go camping. Don't let Tree of Heaven (Ailanthus Altissima), take over your property or neighborhood! Some brush removers are an expensive overkill for many woody saplings, and others break the stem and leave the roots in the ground. Need help pruning and handling overgrown cactus and yucca plants? Buy a variety of sizes for family helpers: The family that weeds together, stays together! Can you do the Twist? Because of its light weight, most kids like the Weed Twister experience - It's an interesting tool and fun to use! Great way to learn about weeds, roots and plants in general! If you're not ready to make a purchase today, please Bookmark this page for convenient reference. Remember that the Ergonica Weed Twister is not like any other twister, puller or claw! You will not find it, or anything like it, at your local retail store! Can it pull out weeds, tubers and woody plants with roots as deep as 6 to 12 inches or greater? Can it also work like a precise hoe against new seedlings and grasses? Does it have a long handle, as long as 54 inches? Please Disable Popup Blockers before clicking the PayPal Payment Button - You may do so in some browsers by pressing and holding the CTRL key while clicking the PayPal button. Payment Options: The Ergonica Shopping Catalog allows you to pay by credit card, PayPal, check, money order, or purchase order. The Ergonica Shopping Catalog provides a secure credit card payment shopping cart. Check for occasional discounts and items not found anywhere else! If you notice a cheap price from bestweeder.com, this is a fraud from China. Please save your money and don't buy anything from bestweeder.com. We can also accept your order by credit card over the phone if you initiate your purchase as a check or money order payment option through the Shopping Catalog Shopping Cart. Through the Ergonica Shopping Catalog you may choose several shipping options. Save gas money and reduce pollution (and your driving time) by shopping online! Ergonica Weed Twister products are made in, and shipped from, California, which gives California and other western states a slight advantage in shipping rates when purchasing through our Shopping Catalog. No sales taxes are charged outside of California by Ergonica! For a more accurate calculation of shipping prices, taxes and pre-approved discounts, especially for large orders, use the Ergonica Shopping Catalog Estimator. Special consideration will be given to nonprofit organizations, garden clubs, volunteer organizations and government agencies. Applications to protect the environment and natural resources are of special interest to Ergonica. INTERNATIONAL ORDERS: We welcome orders from our friends in Canada, Australia and across the pond! Our shopping cart is set up to accurately determine the cost of shipping and handling based on weight to addresses in the USA and a few countries in other parts of the world. JAPAN DISTRIBUTOR: We also have a distributor in Japan for our friends in Japan and other Asian countries: 人間にやさしい雑草&野良ばえジャガイモ抜き取り用「雑草ツイス取ル」のご紹介 . *For shipping areas outside the contiguous United States of America, UK and Canada, or any other questions about the Weed Twister, please e-mail products1[AT]ergonica.com.